Whoever said the garage floor has to be dull gray concrete? Break away from this boring flooring material and transform your garage into one of your favorite rooms in the home with a decorative chip garage floor coating. 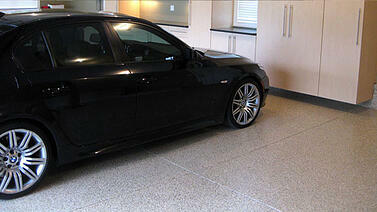 This could be the best option for you if you’re hoping to enjoy luxurious, safe and durable flooring in the garage. Decorative chip coatings are comprised of chip blends in various colors, from earthy browns to steely grays to cool blues. The chips provide the flaked appearance of granite or terrazzo – in-demand interior materials that add to the beauty of your home – yet decorative chip garage floor coating comes at a much more affordable price. At Boston Garage, we offer 13 standard color combinations, but we also accept custom requests, opening up hundreds of different looks. The ability to customize your garage floor coating gives you the chance to match the look found in the rest of your home. Mo matter what color combinations you choose, all decorative chip garage floor coatings come with a shiny, contemporary finish. Just don’t let the high shine fool you – decorative chip floor coatings are also slip resistant, an important safety feature on wet and rainy days. Other concrete surface coatings, such as paint, are subject to peeling and can wear through over time. On the other hand, decorative chip coatings are a hybrid polymer composition. When applied to a concrete floor, the coating establishes a permanent bond for unmatched durability. In addition, garage floor coatings are UV stable, meaning they will retain a like-new look for years to come. The attractive finish not only makes your garage floor beautiful, but it also helps repel skid marks along with stains caused by spilled liquids and chemicals. If oil or other fluids drip onto the garage floor coating, mopping it clean is a breeze. The finish can also withstand extreme temperatures often found in garages for long-lasting resilience and beauty. From parking the car to working on messy projects, this style of garage floor coating can withstand whatever you throw at it. Clearly, whether you plan to showcase your cars in the garage or use the space for another purpose, quality flooring is imperative for achieving the high-quality look you’re after. With the many benefits of decorative chip flooring available to you, it could definitely be the solution you’re after. If you’re interested in having a decorative chip floor coating installed in your garage, please schedule a free on-site design consultation with Boston Garage. We’ll use our decade of industry experience to fabricate the perfect flooring solution.